A broom sweeper, ride-on direct throw is the most common variety which flicks the debris into a hopper in front of the broom which has a trap door ramp which can be closed when sweeping is finished so the load can be lifted up over a bin then the door opened and the debris let go into a bin. This is the most common factory sweeper in Australia sold under various brands such as American Lincoln, Tennant, Power Boss, Nilfisk, and some others. The larger machines have hydraulic driven air fans to filter the disturbed air via a large panel filter which works well unless the dust is consistently very heavy then they will block. Electric vibrators assist in clearing the blockage. Some machines have bag or sock filters which may perform better, but are harder to service. Overthrow broom is similar to the above but bring the litter right over the broom to a hopper position at the rear of the broom. These sweepers allow for a more forward seating position for better visibility and can achieve a greater volume in the hopper. They are less efficient at collecting rough and large debris and the hoppers can be more venerable to damage, particularly as the industry has experience mostly with the first type. Dust filtration is via a panel filter or bag type. Vacuum or suction sweeper: This type of machine comes in a range of sizes from small walk behind to large road machines and generates air suction by a fan. The small walk behind sweepers usually vacuum via a mulching fan into a bag, these are very effective in light litter and leaf and where one of the first footpath sweepers used Australia. As they will emit fine dust they are not a healthy choice for pollutant-laden material or continuous fine dust. A mulching fan where the air and debris is passed through a mulching fan which crashes the debris before it goes into the hopper, these machines are good for bulky light weight litter such as papers and cans and bottles. Clean fan suction sweepers have the fan above the hopper creating a clean vacuum, which draws the debris into the hopper and it is compressed by air movement and wetting. 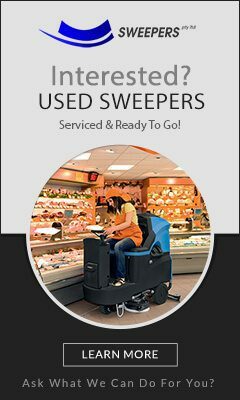 These sweepers can be cleaner and are advantageous where particles are best kept un-ruptured, such as seedpods from trees, which can create allergies. The clean fan should be quieter in operation as it is a larger diameter hence needs to spin less to create the same vacuum and does not have the mulching noise. The third type of vacuum or suction sweeper is commonly referred to as regenerative air. Some do not consider these as a suction sweeper, although this is misleading as the debris is carried to the hopper by suction. The only difference is that the scavenging of the litter towards the suction head is done in an enclosed box or sweep head and the debris is moved by recycled air rather than a broom. This has several advantages over a broom. There are a few moving parts under the truck and the sweeping action is carried out by air, which on other designs normally is wasted to atmosphere. This air can reach fine holes and cracks that a broom cannot. No broom wear, because there is no main broom only side brooms.